*When the bar rests on the ground complete 5 burpees. Score is total FULL rounds of the complex. *Begin back at the Deadlift after the bar has been dropped. Buy-In for each AMRAP is an 800 meter Run. The clock starts with the first run and the AMRAP is performed in the remaining time each round. Score is total reps completed in the three AMRAPs. after song when all athletes return to gym, 50 unison pushups followed by 50 pushups. Garrett Kern is May’s Athlete of the Month. 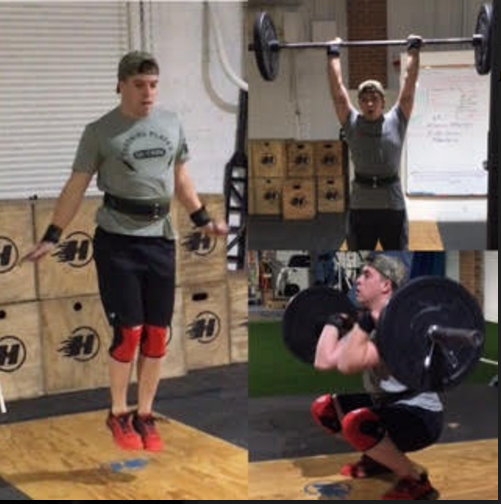 Learn more about why we have chosen this full time Drexel student and Burlington CrossFit lovin’ native as this month’s Hyper CrossFIT athlete. What do you do to pay your bills? I’m a full time civil engineering student at Drexel University and work part time as an assistant project engineer for J Fletcher Creamer. How did you learn about CrossFit and how did you end up in our awesome Box? Through high school I was very active in weight lifting and training in general. I lost the “bug” when I got to college and just couldn’t find the motivation to go and lift by myself every day. I had heard of CrossFit through a few of my friends at college. I actually plowed the snow at Hyper one winter so it was the first place to come to mind. I got in contact with Yolanda to get signed up for the elements course and the community atmosphere has made me never look back. What do you like most about being a FIT member (Hyper CrossFit Athlete)? The people. The coaches are awesome and will talk about anything with you whether fitness related or not. The other athletes are always pushing everyone to go as far as they can go. What is your proudest moment/biggest accomplishment since you started? It’s hard to decide between two. The Clean and Jerk has always been my favorite Olympic lifting movement so I was really happy when I finally hit 4 plates (225 lbs) for that. Open workout 17.2 was also a huge accomplishment for me. I was just getting to the point that I was able to do a muscle up and when that workout rolled around I was able to finish a whole round of 16 of them. Tell us one random fact about yourself that has nothing to do with CrossFit. I love being outdoors. Anything from skiing and hunting in the winter to boating and fishing in the summer. What is your favorite WOD or benchmark? I’d have to go with either Zeus or Murph. I love any of the HERO WODs that are longer then 30 or 45 minutes where they put you on your back at the end gasping for air. It really makes me feel like I have done something that day. It’s time to Chipper down and Squat Clean and Jerk! What advice would you offer to someone interested, but intimidated to try CrossFit? Come to a class and try it out before you make a judgement on it. I have developed a love for CrossFit over the past year that I never would have expected. 4 rounds, each round is 2.5 min. athletes work to complete all reps in the 2.5 min. **Weight belt must be worn from start to finish!